Ugh. I stayed up late last night trying out my idea for the main game mechanism. It worked as intended (after some tweaking) but after a while I had to admit to myself that it just wasn’t much fun. So I have straightened the spine, stiffened the upper lip and headed back to the drawing board. It is a scary thing to do, but I feel I owe it Shakespeare and his Dark Lady to find the best possible use for this theme (which I am totally smitten by). My failed idea was based on a shifting labyrinth of tiles through which you and the Dark Lady would move according to a roll-and-move mechanism. Your task was to keep the Lady from escaping off the edges while searching for tiles (books and letters) with clues to her identity. Here’s an idea for a deduction/hidden movement mechanic. 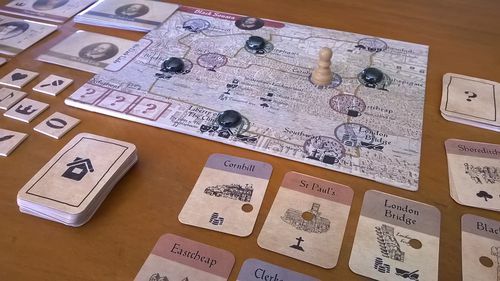 It is distilled from some of the posts above, particularly suggestions from Jan and Deyan about discovering hidden rules, together with ideas about wheels, moving coordinates and clues on the backs of cards. Actually, I didn’t really invent this at all: it was all you guys – thanks! Anyway, imagine you have a map of say 10 locations, joined by paths so that each location has 2 to 4 paths leaving it. At each location are some features, like a tree, a church, a water view, a flower garden, a statue etc represented by 2 to 4 icons at the location. You also have say 30 or 40 tiles (or cards), three or four for each location. Each tile is numbered unobtrusively on one side and also features a dot in a particular position that corresponds to that location (like the clue cards in Outfoxed). On the reverse side is an icon denoting one of the features present at that location. Now, the designer provides a list of numbers that specify the order that you should stack the tiles at the start of the game. (Actually, there would be several different lists corresponding to different paths that the quarry could travel around the board, but each game would use only one with the rest being for replayability.) After ordering the tiles in a stack, face down (and icon up) the pile is “cut” several times as a magician does with cards so that the player does not know the starting point. You are represented by a pawn on the board, while the location of your quarry (the Dark Lady) is hidden as the top tile in the pile. Each turn you would take the top tile and place it on the bottom of the pile, so that the Lady has moved to another location (or not!). The tile icons would give clues as to where she might have moved and could be now. Then you’d move your pawn one space along a path OR, if you think you have tracked her down, search for the Lady at your current location. Each location would have its own “master” tile with a hole bored in a unique position. To search for the Lady you’d place the top tile from the pile onto your location tile and then flip them over as one. If the dot appears in the location tile’s window then you have found her, otherwise you know she is somewhere else on the map, but you still don’t know where. So the aim is to deduce where the Dark Lady is lurking from the sequence of location icons she passes, then try to get your pawn one step ahead and catch her at that location. If you do, you earn a clue to the main mystery (her identity). But here’s the catch – after searching a location, whether successfully or not, that tile is discarded from the game. This means that the Lady will start to jump around the map more and more erratically as tiles are lost from her initially smooth path, and it will become harder and harder to find her. Your aim would be to find her enough times to get sufficient clues to solve the final mystery before you run out of tiles in the deck (or it gets down to say ten tiles).